It has a user friendly interface which explains in very simple, non-technical jargon what you need to know about your selection. 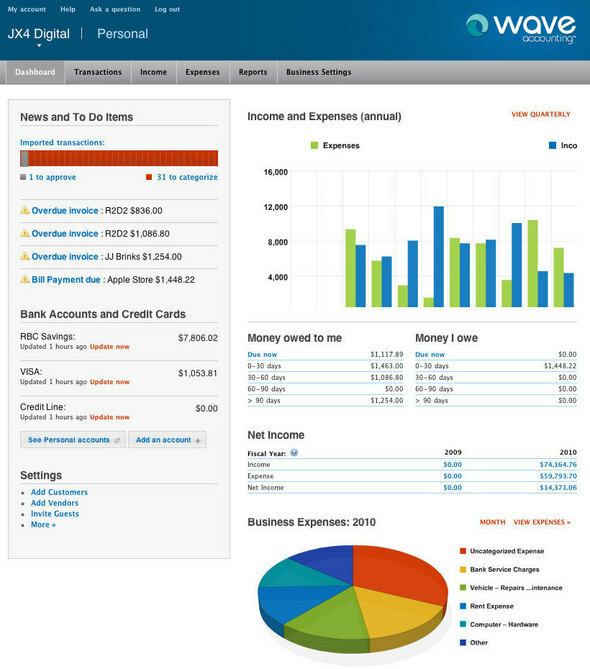 Setup is simple and the dashboard section gives you a useful overview of your business. It allows for integration of bank and credit card accounts, which after initial set up will automatically import transactions on an ongoing basis. Transactions are saved in an uncategorized file, which are then fairly simple to categorize by choosing the appropriate account on the right hand side. For Canadian customers it incorporates GST, HST and QST entry into both invoices and expenses. It also provides a simple period end report, which can be used to complete government remittance reports. You can “invite collaborators” e.g. You can give your accountant or your business partner access to your accounting. All your data is in the cloud, which makes access from anywhere simple. Accounting can be done on the go. Although it provides for an online invoicing solution, customization appears to be limited. Additionally there is no time tracking function, which can be a bit of a limitation for those providing time based services. However, it does allow for integration with Freshbooks, which many freelancers already use. You can also connect your Google docs account which allows you to attach documents (spreadsheets, pdfs etc.) to specific transactions for reference purposes. Update: Wave recently introduced some invoicing enhancements including 4 templates to choose from as well as colour customizations. Formatting of reports is quite basic, which is fine for internal use. However, they have to be prettied up in excel before sending them externally. Reporting is quite simple and does not allow for a great deal of customization. For example you can see your sales by customer, however not by product. Accounts receivable and payable aging are as of the current date. You cannot back date these reports, which can be important when analyzing a prior period. There is no budgeting or forecasting capability. There does not appear to be any inventory functionality. If you sell products and need to keep track of your inventory, this may not be the right program for you (unless you track it separately in a spreadsheet). There is no iPhone app allowing you to enter transactions on the go. Is Wave the Right Fit for Your Business? Ronika Khanna is a Montreal accountant who helps small business owners with their accounting and tax requirements. Do not hesitate to contact her for help with set up of your accounting system and/or any queries thereof. To receive regular blog updates pertaining to small business, accounting, tax and other topics of interest to small business owners you can sign up here. You can also follow her on Facebook or Twitter.